If you’re in the great Pacific Northwest and want to find something to do with the whole family, including your four-legged pup, there are some great events happening this weekend that shouldn’t be missed. Oregon and Washington have a lot of pet friendly events, places to hike, and restaurants that make owning a pet easy. If you live or are visiting, check out some of the events and be ready to give a lot of ear scratches and receive a lot of licks! The 6th Annual Brewer’s Memorial Ale Fest is scheduled for the weekend of May 18 to May 20, 2012 in Newport, OR at the Rogues Ale Brewery. It starts today at 4pm and ends on Sunday at 4pm. The schedule is as follows: Fri 4 to 10pm, Sat 12pm to 10pm, and Sun 12pm to 4pm. It is a 21+ event and admission is $10. This dog friendly brew festival is held inside the brewery and there will be over 50 microbreweries to taste, live music, games for your dog to play such as doggie musical chairs and dog dancing. If your pup needs a bath, a station is set up for that as well. Enter a contest for prizes and enjoy the weekend with fellow pet owners. Proceeds from the event will benefit the Oregon Coast Therapy Animals and the Central Coast Humane Society. 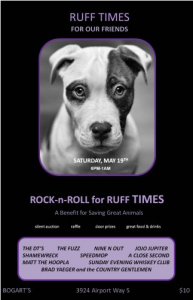 Rock-N-Roll for Ruff Times is scheduled for May 19, 2012 from 6pm to 1am at Bogart’s Airport Way located at 3924 Airport Way S in Seattle, Wa. This benefit is for Saving Great Animals, a match-making rescue organization that works to find a pet that matches your lifestyle. Their goal is find forever homes. The admission is $10 and parking is free. There will be 10 bands and 2 stages. Some of the bands scheduled are Matt The Hoopla, The Fuzz, The DT’s, Jojo Jupiter, JAM, and Speedmop. Aside from great music, there will be good food, drinks, a silent auction, and door prizes. For more information visit the Seattle eventful page. The Mutt Masters Dog Show and Olympics is taking place on Saturday May 19, 2012 from 11am to 5pm in Lincoln City, Or at 1545 SE 50th. Does your dog have what it takes to win a prize? Registration begins at 11am and the contests and shows begin at noon. The fee is $3 per dog for each category or $25 for unlimited entries. You have one day to train for some of the following contests: tail wagging champ, cutest puppy, best frisbee catcher, best handshake, best dressed, and most distinguished elder. For the humans there will be food, booths with pet related information, and gifts. If you don’t have a pet or want to just watch, it’s $5 per person. If you donate some pet food the donation is waved. All proceeds go to help the Lincoln County Animal Shelter. For more information and rules on entering the contests, please visit their website.